Both the Village and the Bay are important elements of Mont Saint-Michel: they contribute to create the magical atmosphere of the island and, above all, they offer breathtaking views. 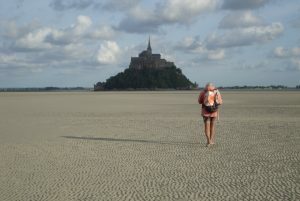 The Bay of Mont Saint-Michel has always helped monks to live in solitude. Before the causeway was built, Mont Saint-Michel was an island and pilgrims would approach only through the mudflat, since the tide was too fast and high. In order to avoid the tourist masses, walk barefoot on the mudflat around the island but, first, duble-check the tides and bring someone with you! The Village lies below the Abbey and above the lower medieval fortifications: there, you will find typical restaurants, shops, hotels and sights. You can enter the island through a stone arch (or, during high tides, through a door in the central tower) and reach the Rue Principale: from here, you will have access to the Abbey and to all the sights within the island. Mont Saint-Michel is always packed with tourists, but don’t forget that it has always been like that, even in the Middle Ages! 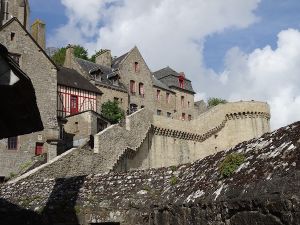 Try the famous omelette at the restaurant Mère Poulard and go uphill following the ramparts in order to reach the Abbey.